Monday 29th September 2014 – 5.15pm – Suzie Wheaton. West Midlands Ambulance Service (WMAS) has now trained 30,000 members of public from Staffordshire in the lifesaving British Heart Foundation HeartStart course. 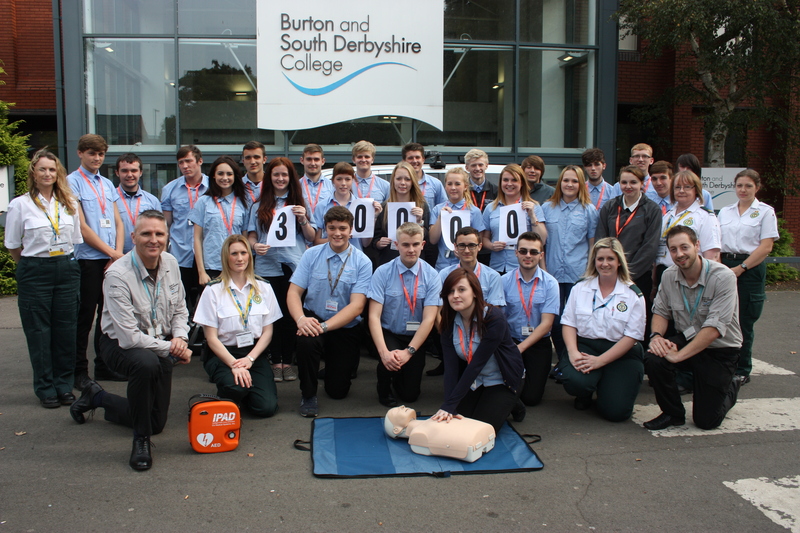 This huge milestone for the project is being marked as ambulance staff train a further 23 pupils at Burton and Derbyshire College (BSDC) to become HeartStart Instructors today (Monday 29th September). On the 1st April 2012, the service embarked on the five year project, aiming to train basic life support skills to 60,000 people within the county. That means the service has, on average, trained almost 33 people every single day across the county, in vital lifesaving skills. The free two hour British Heart Foundation courses are suitable for anyone from the age of ten years old and up, covering various lifesaving and first aid techniques, including CPR (cardiopulmonary resuscitation), the management of severe bleeding, loss of consciousness, chocking and chest pain. Victoria Tufail, WMAS Community Response Manager said: “The project has really gone from strength to strength, with many more courses planned over the forthcoming months. “The Trust is absolutely thrilled by the response for these courses. We believe that it is extremely important to increase the public’s understanding of what they should do in a medical emergency. “One of the main aims of the project was to concentrate on getting schools and colleges involved, providing pupils with lifesaving skills at a young age. Burton and Derbyshire College has really embraced the ethos of the project; not only teaching their public service students in the course, but also taking it one step further with many of the students going on to become HeartStart instructors. For more information about HeartStart or to book on to a free course, please visit http://www.wmas.nhs.uk/ourservices/heartstartstaffs.aspx, contact the team via heartstartstaffordshire@wmas.nhs.uk or call 01785 237341. Please leave a message and someone will respond to your enquiry as soon as possible. Last year 26 students from the college also trained as HeartStart Instructors bringing the total to 49 (including the 23 mentioned above).